I don’t know why I keep putting off these posts until the very last possible minute, but I’m driving myself crazy! For that reason, on Day 12 of the Write 31 Days challenge, I’m bringing back some cupcakes I’ve posted before…. 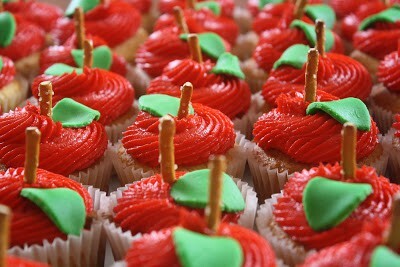 my Red Apple Cupcakes! They’re perfect for Fall and oh-so-easy to make! First, bake up any flavor of cupcakes you want. I made vanilla cupcakes, but you could do red velvet if you want them to be festive… or white almond sour cream (the flavor I sell the most of! ), or even chocolate. The sky is the limit! While they’re baking, get out some fondant… either store-bought green (I love Satin Ice!) or homemade marshmallow fondant and color it green. I recommend Americolor Leaf Green gel coloring. 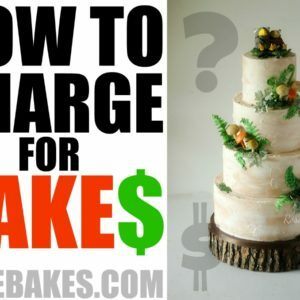 Either way, roll out the fondant and cut some leaves. You can use leaf cutters from this set or this one… or even this cutter. Once the cupcakes are all baked and cooled, it’s time to frost them! I mixed up vanilla buttercream, added some Americolor Super Red gel paste (Tulip Red works too) and mix it up. Then use an Ateco frosting tip 867 to pipe on a swirl of red frosting. You could use other tips – whatever you like best – but I loved the look of a French tip on these. When you have them all frosted, the last thing you’ll do is add pretzel sticks to the center (for the stem) and a leaf to each one… and that’s it – you’re all done! 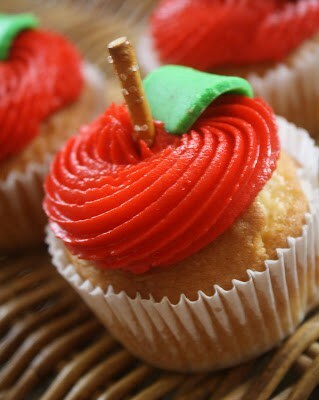 Didn’t I tell ya these Red Apple Cupcakes were easy? I love cake decorating designs (or cupcakes in this case) that come together with no fuss! These are so cute! They look like some cupcakes I saw on CupCake wars. I don’t usually comment, but I absolutely love following your blog! 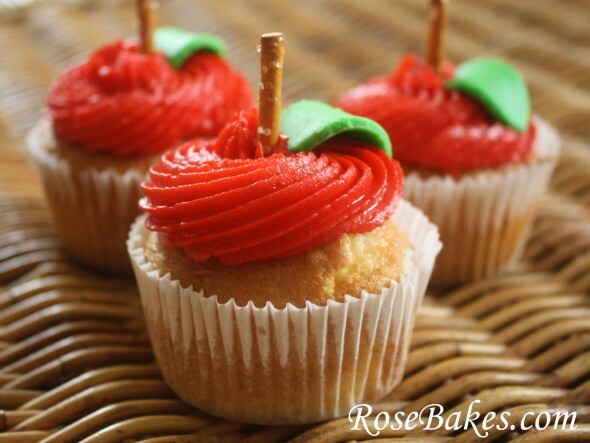 Thank you for all you do 🙂 Just wondering if there is another tip I could use for these apple cupcakes? So cute! I am teaching a cupcake decorating class at 6 ladies at a rehab center next week. I thought these would be easy and fun to make! I think any open star tip would be pretty!